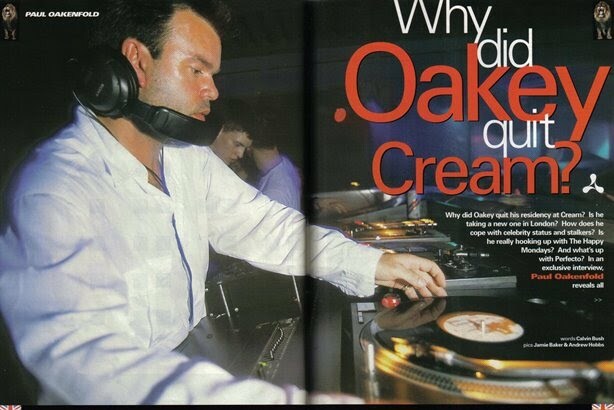 Why did Oakey quit Cream? A sample of just three of the many letters we received here at Muzik when the news was finally announced: after a two year residency at Liverpool’s Cream, Paul Oakenfold played his last set there as a resident on New Years Eve. It took almost everyone by surprise. A brief communication and that was it. One of the most important DJ residencies at Britain had come to an end. It’s hard to overestimate the importance of Paul Oakenfold’s residency at Cream. Here was the world’s most popular DJ (that’s official - ask the Guinness Book Of Records) with his own room to do whatever the hell he wanted, every Saturday night. His loyalty was impeccable. He rarely missed a night, and even when he did, he’d be on the phone checking up to see everything was okay. Paul Oakenfold at Cream became a laboratory, a unique theatre of sound where every week new anthems were established, artists broken, sounds pioneered. And every week, nearly 2,000 people would cram into Cream’s Annexe to have their Saturday nights made immortal. Ensconced in Kensington Royal Garden Hotel, Oakenfold is far more relaxed than we’d expected. He still wears those scampish youthful looks, but there’s no sign of the flashing ego or weary impatience so many Premier League DJs give off. Even his clothes are classic casual - Evisu jeans, Adidas shell-toes, blue cardie-top. Only the barely perceptible greying tips of his thickset black hair give any clue that the world’s most in-demand DJ is starting to feel the pace at the age of 34. So what were your feelings after your last ever Cream residency gig on New Year’s Eve? “Mixed really. I was sad that I was leaving. It had obviously crossed my mind - am I making the right decision? Because I am leaving without a doubt the best room in the country, the best sound system, the best crowd. Everyone who’s been to that room knows how good it was. I worked really hard at it and it had got to the point where I couldn’t take it anywhere else. So I needed to leave it at its peak, so I could look back and say, ‘Yeah, I really achieved something with that club’. When you signed up with Cream, it really set a trend for resident DJs. The story goes that you gave up Cream to be a resident at (ex-Cream partner) Darren Hughes’ new club, due to open later this year in London. Have you been offered a residency in London? So you’re not caught in a tug-of-war between James Barton and Darren Hughes? Your sound seems to have moved away from the Goa trance thing you were into a few years ago. You say you incorporated elements of Goa into your own sound. It must have pissed off some of those at the heart of the Goa scene? What’s happening with Perfecto since you left Warners? All we’ve heard is The Dope Smugglaz, which isn’t exactly typical Oakenfold DJ set fare. “Well, as a label, I’ve regrouped. I resigned from Warners. I had a terrible problem with the Managing Director, who didn’t want me to sign bands. He was saying I should sign Dannii Minogues, which isn’t what I’m about. It’s a waste of my time and a waste of his. As well as your Radio 1 shows, you’ve also got a series of shows on the Galaxy network. What’s that all about? “Each show is based on a different theme, mainly novels. The first one is Filth by Irvine Welsh. Someone reads some of the narrative and I create a soundtrack around it. You’re at home, you listen to the narrative, you listen to the music and you picture the film. We’ve been talking to Ewan MacGregor and people like that. I want to put more of a twist on it so we’re not just getting the author, we’re getting film stars, pop stars, even Jimmy Hill if I’m doing one on football. HE may be operating in that rarefied stratosphere reserved for mega-famous celebrities, but one the striking things about Paul Oakenfold is how conspicuous he is by his absence from the celebrity glamour circuit. You won’t find Oakey hanging out with Val Kilmer or playing some James Bond villain. When the pictures emerged from the Cream New Year’s Eve plane, the one carrying Norman Cook, Zoe Ball and a whole media dress in tow, Oakenfold looked more like their manager than a fellow celebrity, with his sharp suit, stern face and briefcase. You’ve avoided becoming a celebrity outside the club scene itself. How have you managed to avoid the tabloid lifestyle? Do you get any weird people bugging you in clubs? Finally, what message do you have to all the Cream regulars who reckon you’ve betrayed them? DO you know who Paul Oakenfold’s mystery stalker was? Maybe you were at school with her? Or one of her flatmates? Do you have any stories about her? Or of any other DJ stalkers? 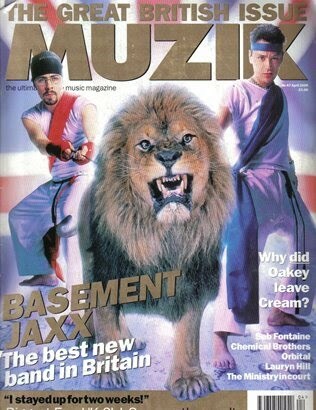 Call the Muzik office on 0171-261-5993. And don’t worry. We’ll call you straight back. Personal details: 21 year old student from Manchester. How long have you been coming to Cream? Five years. What do you think of Cream tonight? Better than ever. It’s fu*king rocking, it’s not lost it at all. What do you think about Oakey leaving? I’m absolutely devastated. He is the life and soul of this club. He’s the lord of the dance. What do you think about DJs like Seb Fontaine and Tall Paul coming in? They don’t match up to his status, his quality. He is what house music is all about. I’ll still come to Cream, but without Oakey not so often. Personal details: 23 year old Cream worker from Liverpool. How long have you been coming to Cream? Since it started and I’ve been working here for four years. What do you think about Oakey leaving? He’s got to try different things. A lot of people are disappointed but it’s given him a chance to do other things. The club’s doing well now so he can’t be missed that much! The courtyard with Oakey will go down in clubbing history. What do you think about DJs like Seb Fontaine and Tall Paul coming in? The kids like them and they’re getting crowds in, but it’s not my taste. Personal details: 19 year old student from Liverpool. How long have you been coming to Cream? Years, but I used come here a lot more to hear Oakey. What do you think of Cream tonight? Tonight the atmosphere is as good as it used to be. It hasn’t been like this for ages and that’s to do with Seb. What do you think about Oakey leaving? He’ll be back. What do you think about DJs like Seb Fontaine and Tall Paul coming in? Seb Fontaine is one of the best DJs about. I hope it stays like this, it’s one of the best nights I’ve had at Cream. Personal details: 31 year old “security consultant” from Toxteth. What do you think of Cream tonight? It’s a lockout. What do you think about Oakey leaving? Like Shankly said about Liverpool, there’s no one player bigger than club. What do you think about DJs like Seb Fontaine and Tall Paul coming in? They might come through and be the biggest thing ever. You’ve gotta let the young blood come through. 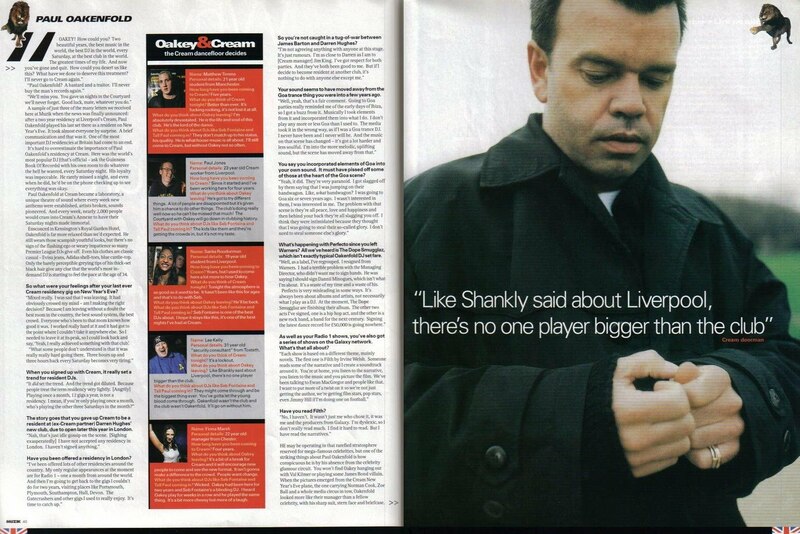 Oakenfold wasn’t the club and the club wasn’t Oakenfold. It’ll go on without him. Personal details: 22 year old manager from Chester. How long have you been coming to Cream? Four years. What do you think about Oakey leaving? It’s a bit of a break for Cream and it will encourage new people to come and see the format. It isn’t gonna make a difference to the crowd. People want change. 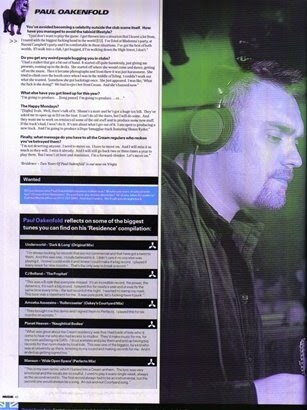 What do you think about DJs like Seb Fontaine and Tall Paul coming in? Wicked. Oakey had been here for two years and Seb Fontaine’s a blinding DJ. I heard Oakey play for weeks in a row and he played the same thing. It’s a bit more cheesy but more of a laugh.